Many of the late pedanda’s disciples are wearing commemoratives t-shirts emblazed with the message ‘Death is life’s friend’. Balinese history is rich in celebrated Brahman high priests. All were great teachers and reformers, starting with RsiMarkandya, who introduced Brahmanism in the 8th century. At the beginning of the 11th century, EmpuKuturan united all of Bali’s warring religious fractions. Dang HyangDwijendra, the most celebrated of the Bali’s historical figures, arrived in the 16th century having fled the wave of Islam engulfing the Majapahit Empire in neighbouring East Java. He introduced a new, more Majapahit version of Siwa-Budha religion. South Indian ritualistic Hinduism had been practiced in most of Bali since the Indianization of Southeast Asia in the 7th century. 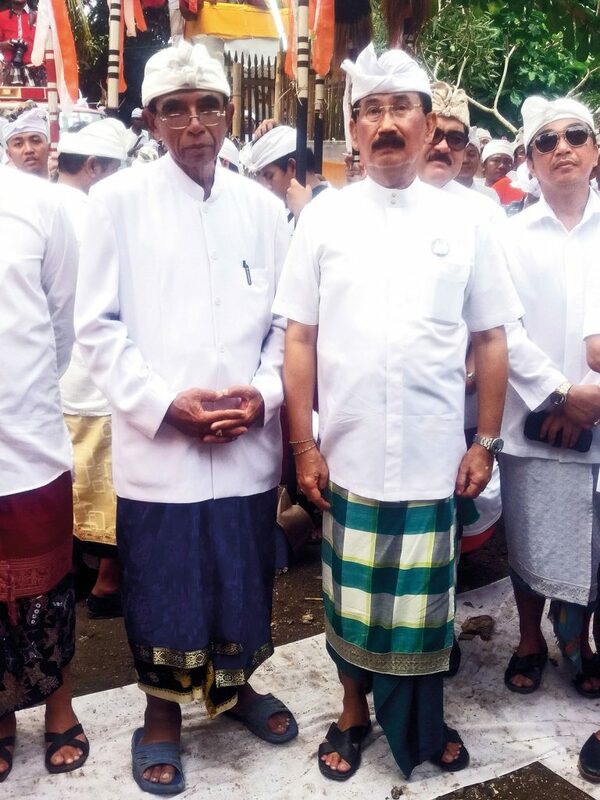 By the late 1990s, as Bali entered the global area (GLO-BALI-sation it is sometimes called), it seemed only natural that one of the island’s charismatic high priests would become media-savvy and start a religious movement. That high priest was Ida PedandaGede Made Gunung from Blahbatuh, half way between Denpasar and the art province of Gianyar. PedandaGunung, as he was popularly known, established an asram at his ancestral home where pilgrims from all over Indonesia — and including many foreigners — came to study. One of his most devout followers was American Soma Temple, from Seminyak, and her great friend Milo the fashion designer and his clan. PedandaGunung made many pilgrimages to his beloved Mother India with an entourage that included fellow high priests, and a group of Seminyak priests, invited by Milo, and other followers. 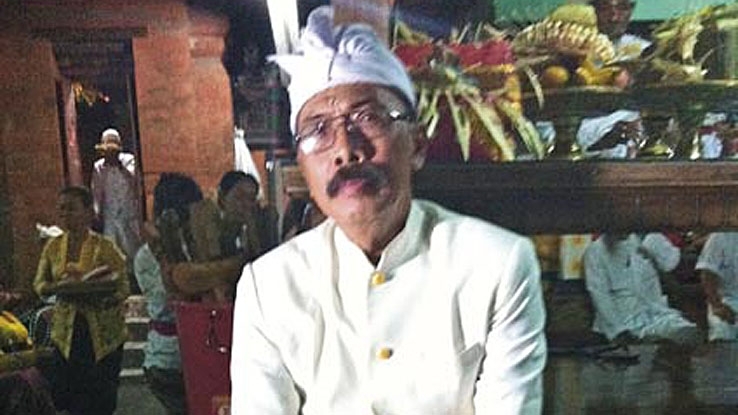 At the relatively young age of 53, PedandaGunung became a nabe, a teacher and ordainer of other high priests — and his reputation grew in the Hindu Balinese community. His wachana (lectures) on Hinduism were light and easy and grew huge crowds. 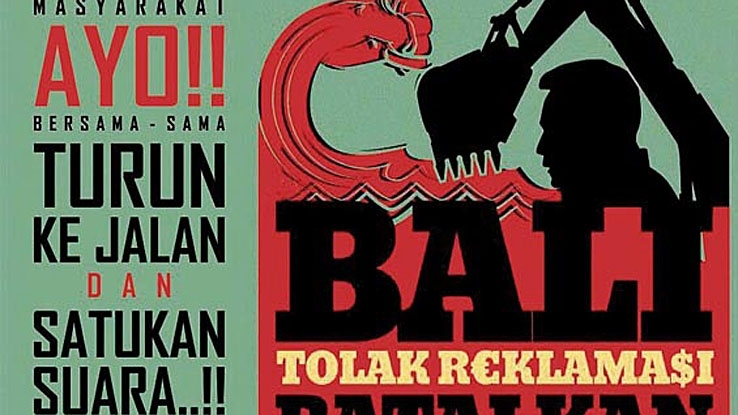 Some royal princes became jealous of his fame — celebrity always comes with a price — his influence having spread, most recently, to the Anti-Benoa Bay Reclamation movement which has hundreds of thousands of Balinese supporters. 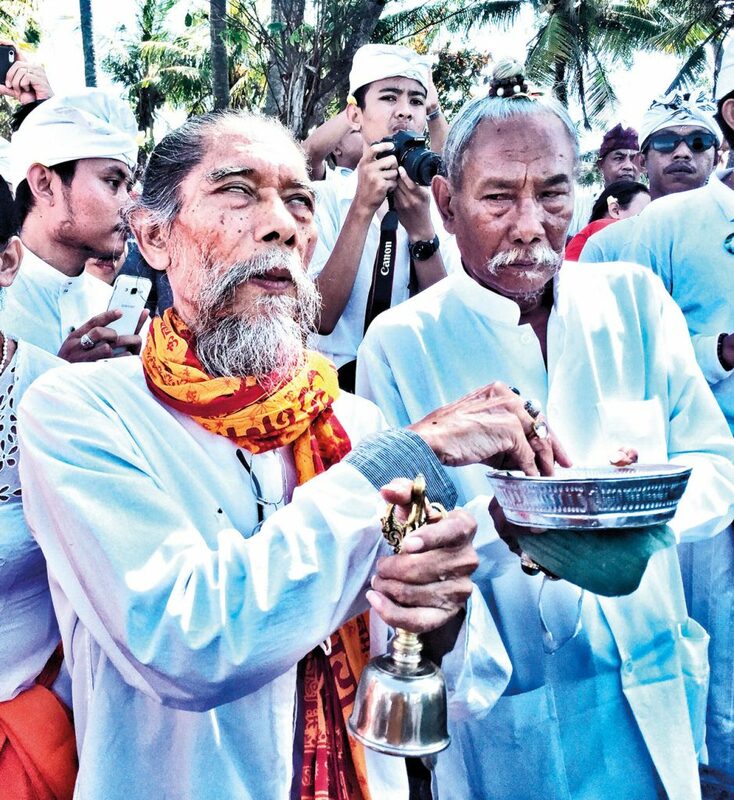 When Pedanda Gunung died at the age of 65, the island went into shock: the great guru had been a permanent fixture on television, and was often invited to officiate at the island’s great ceremonies. His legion devotees were devastated. Milo and the Seminyak acolytes went into deep mourning. I was a huge fan of Pedanda Gunung, and we sometimes had a chat when our path crossed. Growing up in a Brahman home I was less terrified of the hauteur of the island’s Brahman high priests than most. On one occasion, I accompanied him and his permanent retinue of loyal disciples — including Agung Dewandra Djelantik, his principal aid from the Karangasem royal family — to the Dieng Plateau in Central Java, to inspect a Hindu temple that had been desecrated by local Muslims and had become ‘unclean’. We stopped first at the bupati’soffice where the good pedanda was received royally. We then moved, in convoy, to the plateau — the centre of the 6th century Hindu Sanjaya dynasty (many exquisite candi temples remain). At one point during the trip the pedanda went deep into a famous meditation cave and, upon emerging, pronounced that it was like a light bulb whose firmament had gone out. Like many of Bali’s high priests, he favoured using simple descriptive language to describe complicated spiritual matters. This shared journey was some years ago, and I had not kept up, so I didn’t rush to the body washing late June, like half of the island, but committed to attending the two day cremation, and to recording the events. I arrived at the village at 10 a.m.
Blahbatuh is a large traditional village on rolling land; the Brahman compound of PedandaGunung is down a gentle hillside on the eastern outskirts of the village, just below and behind the village’s most important temple, an imposing mass of shaped andesite. The pedanda wanted a simple funeral — no elaborate coffin or fancy badé funeral bier — but the family and followers have created an exquisite Indian-style roofed funeral pyre plus enclosure — which they named Taman Sriwedari (garden of the angels) — replete with mini-moat, fountains and a silver-coated low fence built in the style of a Balinese temple wall. It was inside this enclosure that most of the days ceremonies took place. The courtyards were packed with families, devotees and high priests, all wearing PedandaGunung’s signature orange. Inside the house’s main court, the official guests sat sipping tea: the Ubud, Peliatan, Mengwi and Karangasem princes in the north pavilion, rubbing shoulders with a busload of high priests. A big group of lady high priests — Mini Mouse hairstyles glistening — sat eloquently in the large west pavilion, watching the stream of pupils, fans, groupies, and celebrities who had come to pay their respects. 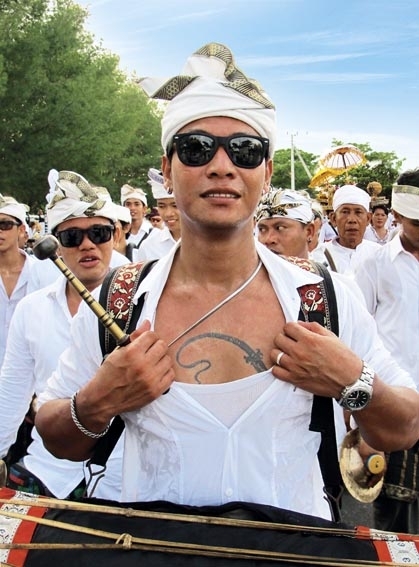 Just before 11 a.m., the prince of Mengwi, the former Mayor of Badung regency, the island’s most populous, has his palace’s honour guard — the BarisTekokJago chequered warriors line the white carpet that runs from the ceremonial pavilion where the coffin rests — to the funeral pyre outside. 11.30 a.m. : The governor arrives, prays and leaves. No love there: the pedanda was at odds with the government’s policy on urban (not cultural) tourism. 11.45 a.m. : The late proclamator President Soekarno’s daughter Sukmawati arrives accompanied by the erstwhile Raja Majapahit Dr.GustiWedakarna III and his rather stern bodyguards. I remind them to relax as the spirit of the day is suci (holy) not serem (severe). They giggle. Many of the late pedanda’s disciples are wearing commemorative t-shirts emblazed with the message ‘Death is life’s friend’. 11.50 a.m. : CokPutera of Puri Saren Ubud and Cok Nindia of Peliatanare almost lit by a falling exploding drone. The late high priest had specifically forbidden drones. The Coksare visibly shocked (makecosatma) by the incident. I tell the shocked crowd that it was a radical Islamist duck suicide bomber. Just before noon, the white kasa cloth, which traditionally proceeds the coffin on its way to the cremation ground, is unfurled and held aloft by a posse of lady high priests, all dressed in orange. It is a very impressive scene: the priestess bearers, all dressed in orange; and the chequered honour guard with the Mengwi prince playing ring master. Just after noon the ancient gambangmusic starts and the simply-wrapped body moves the 30 yards from the house’s ceremonial pavilion to the specially constructed Taman Sriwedari enclosure in the house’s forecourt. The chequered warriors lining the way let out a loud battle cry — “Whoooh” — as the coffin moves past. 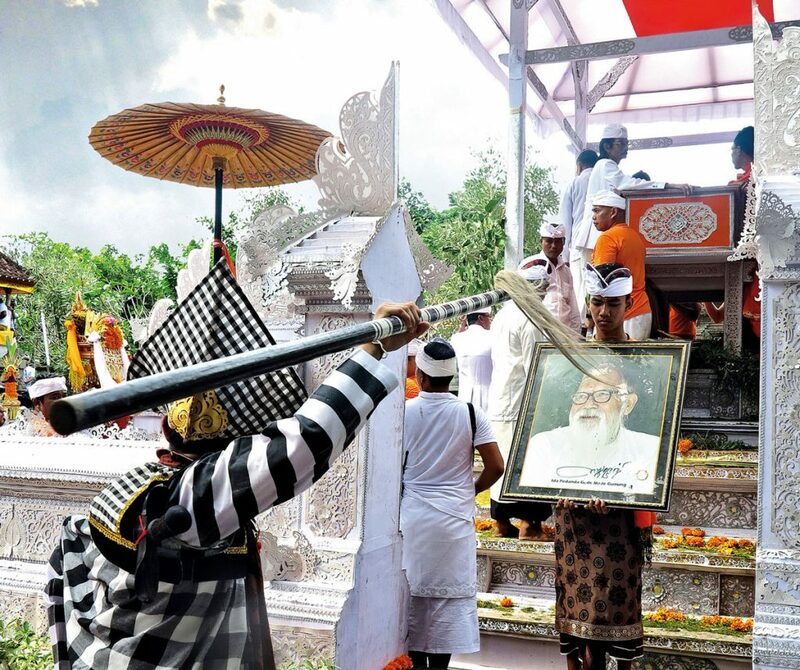 The late pedanda’s sons and some nephews receive the body and place it in an ornate orange box atop the pyre. High priests scramble to splash the corpse with holy water from 30 or so of the island’s top temples. The eldest son then lights the pyre as the Baris warriors start a dancing perambulation inside the enclosure — with the deceased’s grandson standing in front of the burning pyre, holding a photo of the late priest as the flames rise. The prince of Mengwi is a very visible ring master for the duration of this magnificent spectacle. Thousands watch from behind the enclosure low wall. The kulkul tower is beating. The deceased’s wife stands to the north of the pyre with her children. She has been amazing all morning (as commander-in-chief of all the rituals, together with the offering-maker PedandaIstri and Ida BagusNyoman Putra from GriyaSampiang, Central Bali’s foremost master of ceremonies) — but now her distress shows. A giant tambur drum and accompanying angklung orchestra sound in a corner nearby. There are few dry eyes in the forecourt. 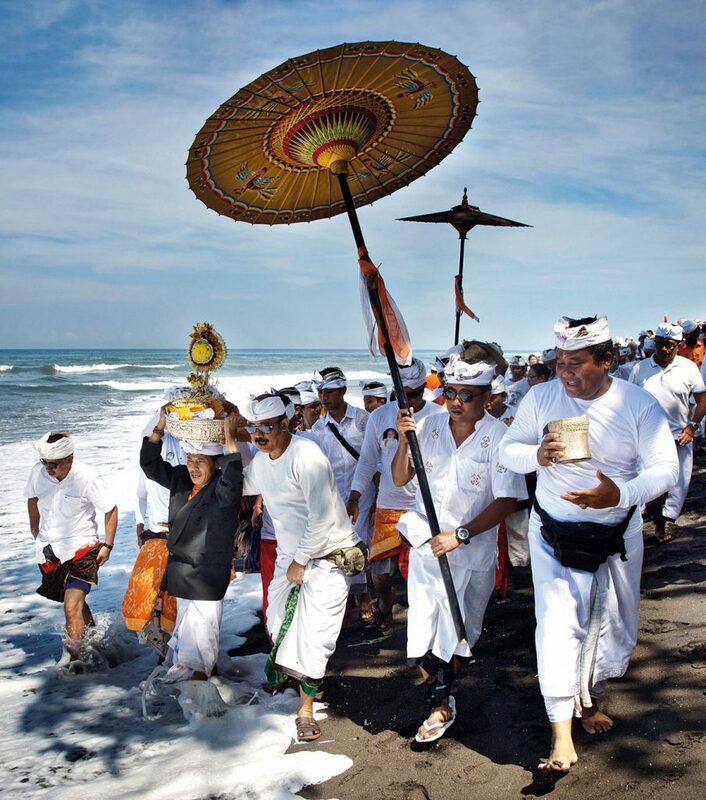 Normally, in Bali, a body is cremated at noon and the ashes taken to the sea that afternoon. So elaborate were the rituals for PedandaGunung’s sending off that they needed to be spread over two days. Today, I arrive at 6 a.m. to find the family and some of the high priests already sorting out bones from the ashes. The high priests and priestesses had slept the night on mats on the verandas of the ashram next door. 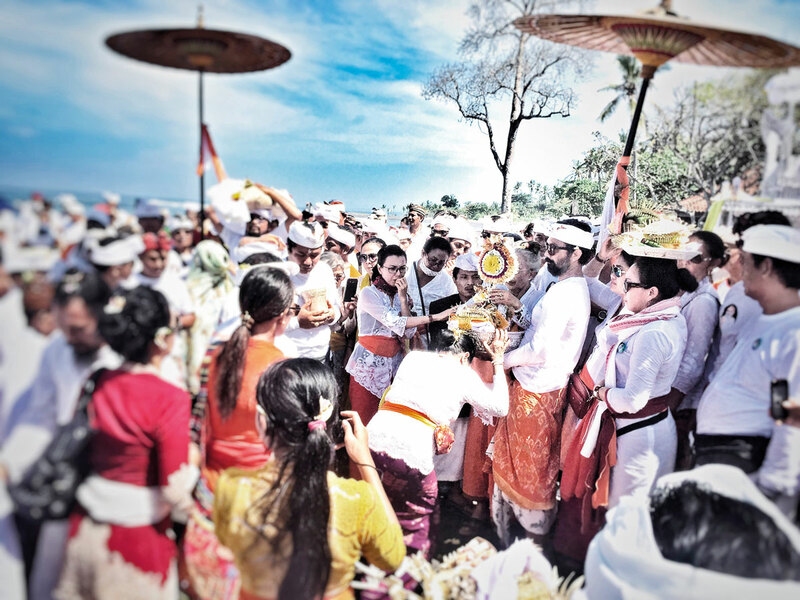 At 7 a.m., the ashes are collected, blessed, then put into a flower-bedecked adegan spirit effigy and moved to the special uparingga bier that will soon convey them, in a rousing procession, to the beach at Saba. Noon, Saba Beach: The procession arrives at the spectacularly located PuraSegara temple — a special platform of offerings has been set up. The family prays as a special TopengSidakarya is performed — both inside the temple and on the beach near the adeganon its bier. After prayers, the gathered high priests and priestesses rush the adegan, cradled by the deceased’s widow, and take turns saying a final, very moving farewell, by heading the bottom of the silver tray in which the ashes sit. This is extremely rare ritual, afforded only the highest of high priests. Everyone present is overcome with emotion. Eventually, the high priests retreat and the family race the ashes and accompanying spirit effigy down the beach to the waiting boats. The gathered crowd — hundreds of devotees, scores of priests and family members — watch and weep as the boats negotiate the dangerous surf. No one wants to leave — everyone wants to savour these last poignant moments. P.S. : I had tears streaming down my face for the last five minutes of this extraordinary video. I mean, I knew PedandaGunung, but was not close. Yes, over the past two days I have fallen in love again: with his widow, with everyone in the family really, especially the sons with beards and the firemen who came to the body-burning, but not enough to warrant weeping. Everyone was weepy at the beach when the great man’s ashes were conveyed out through the waves magnificently — in the Balinese fashion — and suddenly the show was over. No one moved for five minutes (normally there is a stampede for the car park or the nearest babiguling) but the mood had changed from efficient to solemn during the nyungkemritual and that’s when the tears started on the beach, and that’s when I started crying watching the video.